In university we were given various compulsory professional ethics modules, which I considered largely pointless. I still do. Perhaps they should simply have given us a copy of Uncle Bob’s new book “The Clean Coder”. When it comes to how we act as professionals it seems as though there is a certain taboo around the subject. Speak to any software engineer and he will be more than happy to tell you about all the mistakes he has made in his code; No one wants to discuss their professional conduct. 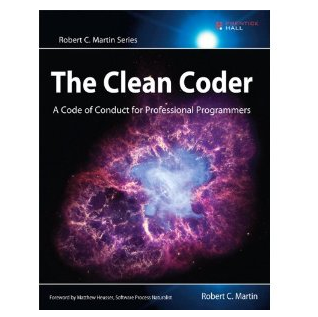 “The Clean Coder” cuts through all that with a frank and open discussion. Bob Martin admits the mistakes (and successes) that he has made through his career while explaining how to avoid making them yourself. As with his previous book, Clean Code, his conversation writing style and straightforward manner makes this book a great read. All readers, from experienced managers to fresh graduates, will find questions they need to answer about the way they work. And as any book on this topic should, it raises some pretty inflammatory opinions. Robert Martin doesn’t shy away from making bold statements, for example saying that if you are giving 8 hours a day to your employee you should be giving an additional 4 hours a day to self study to truly consider yourself a professional. A big ask for many of us. And his outright condemnation of “entering the zone” will definitely get some of the master hackers I know more than a little riled up. Conversely some of his advice seems too obvious in retrospect. His explicit declaration that “to try is to fail” reinforces something I should have known all along; no amount of hoping and finger crossing can make you develop any faster. If code is going to take 5 days, no amount of “trying” will make it ready in 3. And while most of his advice is “non-technical” there is still plenty of advice on development itself. I encourage every developer to have a look at this book and reflect upon what it truly takes to be a professional.